The relationship of the Popes with Fatima became of more importance since the pontifical trips of Paul VI but mainly the trips of John Paul II. But already before, the bishop of Rome was interested in the event mostly in the message delivered by Our Lady in Cova da Iria. The first reference known is dated January 9th, 1929, when Pius XII received in audience the students of the Portuguese Pontifical College of Rome. In the end of the meeting, he read in Portuguese the invocation of the picture (“Mother of Mercy – Save Portugal”) that he received in that same day coming from Portugal and distributed by the students. The pictures, with the image of Our Lady of Fatima, had been printed by the Apostolate of Prayer and had the imprimatur of the bishop of Leiria, Mgr. José Alves Correia da Silva, and dated May 17th, 1926. Also in 1929, in December 6th, Pope Pius XII blessed a statue of Our Lady of Fatima to give to that College. This statue had been made by the same sculptor of the statue of the Chapel of the Apparitions, whose name is José Ferreira Thedim. On October 1st, 1930, the same Pope conceded plenary indulgence to the pilgrims of Our Lady of Fatima. According to the journal Voz da Fatima, dated November 13th, 1930, it is conceded an indulgence of “seven years and seven quarantine to all Christian faithful – repented of his sins – every time he visits the Shrine and prays there for the intentions of the Pontiff”. A plenary indulgence is also conceded – once a month – to the pilgrims in group that visit the Shrine and pray there for the intentions of the Pope. It is important to mention that these three acts occurred before the publication of the Pastoral Letter of the bishop of Leiria in which he considers the Apparitions of Our Lady, related by the three Shepherds, “worth of belief”, on October 13th, 1930. There is no memory of any official manifestations concerning Fatima from his antecessor Benedict XV, Pope at the time of the Apparitions. The first official position of the Vatican on Fatima comes from Pius XII, on October 31st, 1942, 25 years after the Apparitions: on that day, the Pope consecrates the world to the Immaculate Heart of Mary, responding to the requests of Our Lady transmitted to the three Shepherds in Fatima right in the middle of the II World War. Four years after, on May 13th, 1946, the Pope sends cardinal Benedetto Masella to Fatima to crown the statue of Our Lady. In these two occasions, Pius XII delivers radio messages, in Portuguese language, to the pilgrims present in the «saint mountain of Fatima» to place at the feet of the Patroness Virgin “the filial tribute of your imprisoned love». «Queen of the Holy Rosary, Refuge of human being, we trust, entrust, consecrate, not only the Holy Church, mystical Body of Your Jesus, but also the entire world», he said. John XXIII visited Fatima while he was Patriarch of Venice before succeeding Pius XII, on May 13th, 1956, and expressed his gratitude for having been invited for what he called the «festival of mercy and love» offered by the Virgin Mary. The first Pope to visit Fatima was Paul VI, on May 13th, 1967, to celebrate the 50th anniversary of the Apparitions of Fatima and the 25th anniversary of the Consecration of the world to the Immaculate Heart of Mary. 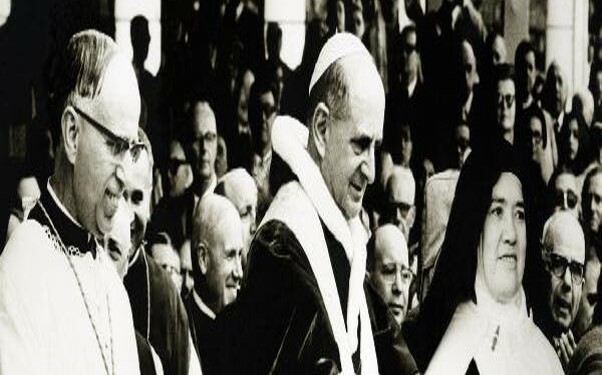 Paul VI came as «humble and confident pilgrim» just to Fatima at the invitation of the Portuguese bishops, which was a diplomatic solution found for the Pope to come to Portugal avoiding the idea of Pope’s recognition of the regime of the Estado Novo. There was some tension at that time between Lisbon and the Vatican owing to Pope’s participation in the International Eucharist Congress in Bombay in December 1964, integrated in a pilgrimage to India, only three years after Indian army had invaded and taken Goa, Daman and Diu. The president of the Republic, Admiral Américo Tomás, and Oliveira Salazar, as prime minister, accompanied the visit in which it was possible, for the first time, to see in public Sister Lucia who lived in cloister in the Carmel of Coimbra. There is no record of any position from the 33 days of papacy of John Paul I. While he was Patriarch of Venice, Cardinal Albino Luciani visited Fatima on June 10th, 1977, almost one year before becoming Pope (August 26th, 1978) and presided with a pilgrimage of over 50 Italian people from Venice. According to the newspaper Voz da Fatima, the cardinal reminded the previous presence of John XXIII in Fatima as Patriarch of Venice and in his prayer to the pilgrims, appealed to the fulfillment of the Message of Fatima – penance and prayer, specially the prayer of the rosary – and the observance of the Gospel. Next day, the next Pope John Paul I met Sister Lucia in the Carmel of Coimbra. But it is with John Paul II, in 1981, that contacts formed and intensified in relation to Fatima. Right after the assassination attempt on his life, in Saint Peter’s Square, in Rome, on May 13th, 1981, the Pope attributes to the protection of the Virgin of Fatima the fact of having survived the bullet fired by the Turkish Ali Agca. One year after, he comes to Portugal having as main purpose Fatima with the aim of thanking «the Divine Providence in this place which the mother of God chose in such a particular way». On the night of May 12th, 1982, John Paul II is the target of an attack of the fundamentalist ex-priest Juan Fernández Krohn, who tried to reach the Pope with a knife; he was stopped by one of the Portuguese policemen, who protected the Pope. Two years after, in 1984, John Paul II offered to the Shrine the bullet that was in his abdomen; this projectile was enchased in the crown of the statue of Our Lady. 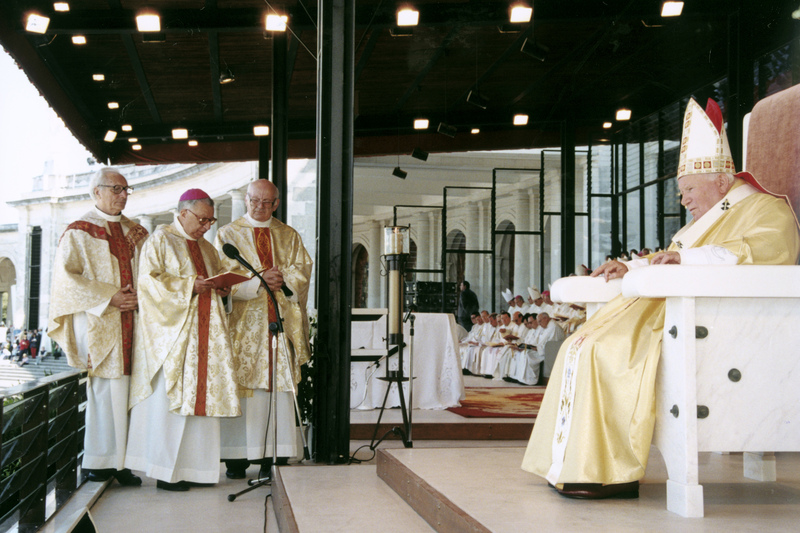 The second visit of the Polish Pope to Portugal, in 1991, included the Vigil of Prayer, on May 12th, and the celebration of Eucharist the next day. He underlined in his homily the importance of the Message of Fatima for the men of today by characterizing it as the echo of the words of Jesus and His Mother, in the Golgotha, delivering to her John, the beloved disciple: «Here She had to welcomed all. Every one of us, men of this century with its difficult and tragic history». The third and last visit of John Paul II was on May 13th, 2000, already with a fragile health, where he presided at the celebration of the beatification of Francisco and Jacinta Marto. The Pope insisted on coming which forced the services of the Vatican to cancel the celebration initially scheduled for April 9th, in Saint Peter’s Square, in Rome. The revelation of the third part of the so-called Secret of Fatima was another clear sign of his close relation that he always kept with Fatima. This announcement was made on May 13th, 2000, by the then Secretary of State of the Vatican, cardinal Angelo Sodano. The Secret of Fatima is considered as the fundamental core of the Message of Fatima and refers to the visions and words witnessed by the Shepherds in the apparition of Our Lady of July 13th, 1917. Its content was written by Lucia in the 40s. The two first parts (vision of hell and devotion to the Immaculate Heart of Mary) were revealed in 1941; the third part (vision of the pilgrim martyr church and the ruined city) was written in 1944 was kept secret and only revealed in Fatima in 2000. The third part of the Secret revealed in Fatima in 2000 referred to the assassination attempt on the Pope. John Paul II had linked this revelation to the events of May 1981, in Rome, of which he survived saying many times that «a mother’s hand» had deviated the trajectory of the bullet. The Prayer area wasn’t unknown to Benedict XVI and much less the Message of Fatima. Pope Benedict XVI visited the Shrine of Fatima on May 12th, 2000 to mark the 10th anniversary of the beatification of Francisco and Jacinta Marto. He has been in Fatima when he was cardinal Joseph Ratzinger to preside at the celebrations on October 13th, 1996, but his connection is prior to this visit: as Prefect of the Congregation for the Doctrine of the Faith, he had studied the Apparitions and the Message of Our Lady. On May 13th, 2007, he sent as Pontifical Legate the Secretary of State cardinal Angelo Sodano to preside at the opening celebrations of the 90th anniversary of the Apparitions and delivered a message underlining the value of the prayer of the Rosary, as Our Lady so much requested to the three Shepherds. Benedict XVI attended the blessing of the candles in Cova da Iria on the night of May 12th, 2010, and presided at the Eucharist on the 13th. In his homily, he underlined that the example of life of Lucia, Francisco and Jacinta «spread and multiplied […] in countless groups throughout the world […] ». «May the seven years which separate us from the centenary of the apparitions  hasten the fulfilment of the prophecy of the triumph of the Immaculate Heart of Mary, to the glory of the Most Holy Trinity», he also urged. Francis will be therefore the fourth Pope to visit Fatima and his connection to the place of the Apparitions starts right in the symbolism of the day of his election, in March 2013: the 13th is linked to the Apparitions. His connection becomes more effective and evident two months later when the Portuguese bishops, on his demand, dedicated his pontificate to Our Lady, during the celebrations of May 13th, in Fatima. Right after, in October (month linked to Fatima), also on his demand, the statue of Our Lady, venerated in the Chapel of the Apparitions, was taken to Rome for the Marian Day organized by the Pontifical Council for Promoting New Evangelization in the context of the Faith Year. His wish to go to Fatima (“tengo ganas de ir a Fátima”) was transmitted to the Portuguese bishops on September 7th, 2016, in the context of their ad limina visit. The ad limina visit, or fully ad limina Apostolorum (visit of the tombs of the Apostles, in Rome) is the name given to the obligation of the diocesan bishops of a country of going to Rome, every five years to deliver an account of the pastoral situation in their dioceses and to reflect with the Pope, by listening to his advices and recommendations, as well as the Vatican authorities. The coming of Francis to the Shrine of Fatima, on May 12th, 2017, will be the concretization of his intention manifested, in private, to Mgr. Antonio Marto, bishop of the diocese Leiria-Fatima, in April 2005: if God gives him «life and health», he would be in Cova da Iria to celebrate the centennial of the Apparitions of Fatima.